Is your company looking to upgrade its products? Need a way to stand out in the competitive climate? India is experiencing a major economic transition, which has significant effects for surfactants. An increasing middle class and average disposable income helps drive the demand for surfactants across a range of industries in India. Key players are closely monitoring growth sectors to capitalise on the next big opportunity in surfactants. In order to become a global surfactants industry leader, India is now looking to invest in research and development, sustainable solutions and increased capacity in line with the country’s socioeconomic development goals. India’s plans to become a global exporter of surfactants means that trade relationships could change considerably in the coming years and decades. Chinese manufacturing costs are still too competitive for India to export to SE Asia; however, this export market is also now emerging. For small to medium-sized Indian players, the real question lies in how to best add value to products in a highly competitive market. 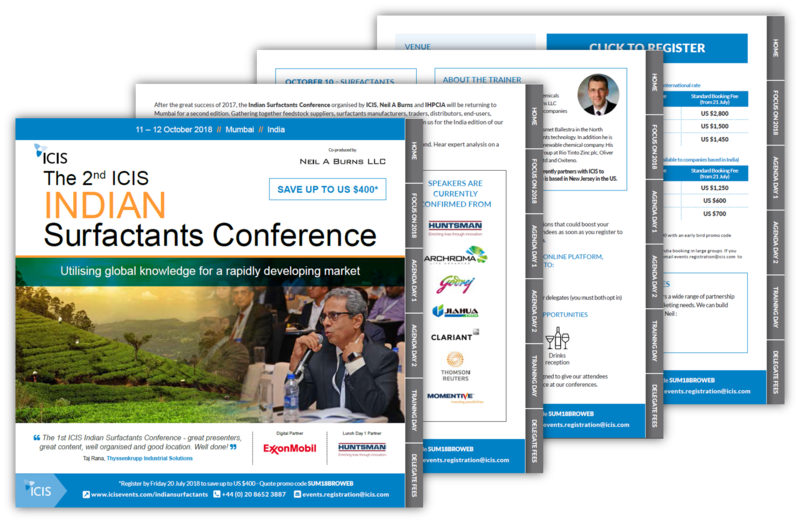 Attend the 2nd Indian Surfactants Conference to utilise global knowledge for a rapidly developing market. We annually feature a thought-leading speaker line-up of senior industry experts from some of the highest profile companies in the world. The ICIS Surfactants portfolio of events provides the perfect platform to showcase your company’s products and services to a wide variety of industry stakeholders. Take this opportunity to raise brand awareness and foster existing relationships whilst developing new commercial connections through bespoke promotional packages. Complete the conference online registration form for group of 3 and more from the same company at the same time and save up to 10%.